Phillip Hua: "The Secret of the Picture"
It’s a little risky, judging paintings. And Marin MOCA has presented one of the trickiest types of exhibitions: emerging artists (“Emerging Artists of the Bay Area,” through April 13, 2014). Sometimes emerging means only “new,” new technical discoveries, digital wizardry, explosions (akin to those in many of the newest movies). Kenneth Baker has chosen five artists (Justine Frischmann, Al Grumet, Carl Heyward, Phillip Hua, and Jennifer Kaufman) who are each accomplished in their chosen media. But it is a combination of discovery and ... something harder to describe... that draws me to the art of Philip Hua. Let’s talk about the technical bits first. Hua teaches Digital Media at the Academy of Art University (he has a BFA from AAU, from 2003). 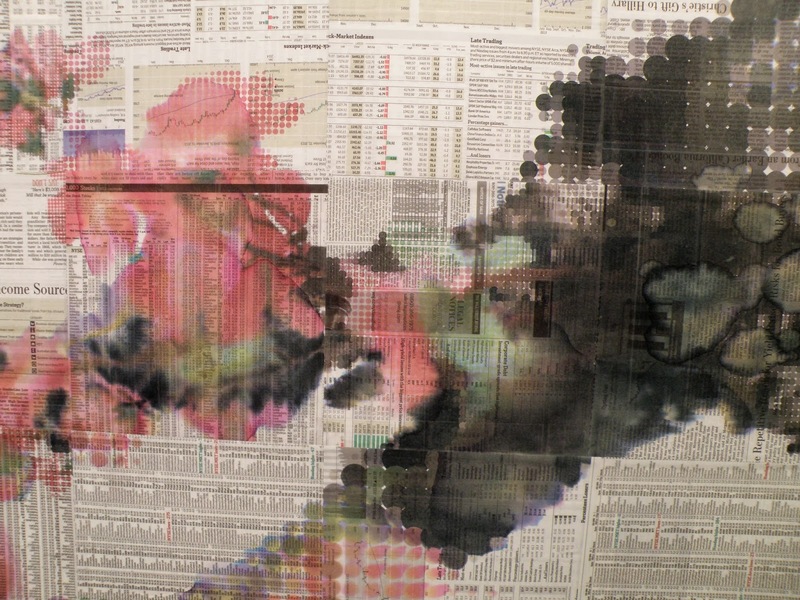 On his website, Hua explains that he begins each work with a digital composition. But it’s what he ends up with that takes your breath away. We see the “branch” and the “blossom”; close-to, these patches of color are not re-presenting the natural world at all. There is a beautiful sheen, and a mysterious grouping of soft colors; the picture changes as you move around it. This work does what every artist I have ever known wants their work to do: it stops you in your tracks. 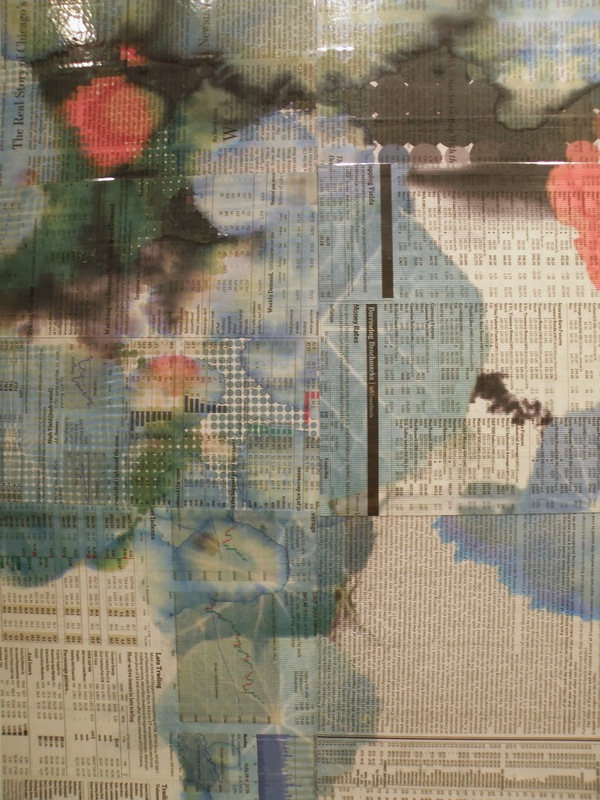 The labels tell us that these paintings are all composed of “pigmented ink and packaging tape on The Wall Street Journal newspapers, mounted on Dibond.” These are simple materials, brought together, mastered. 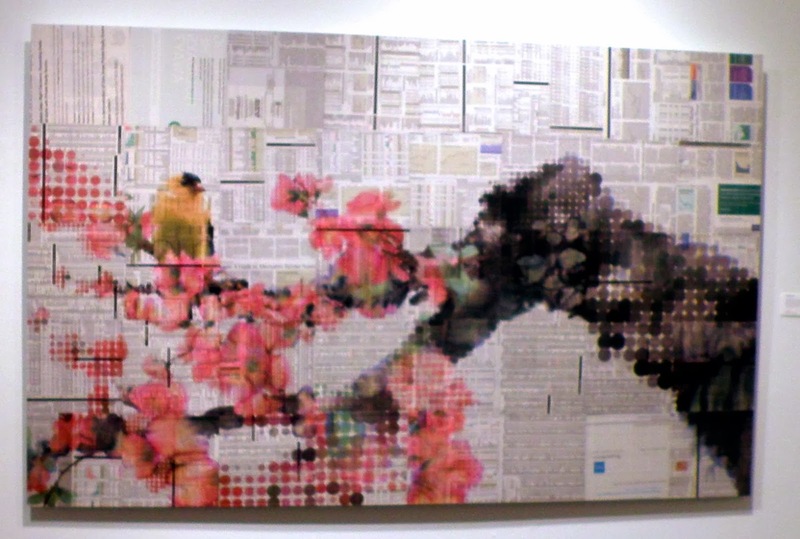 The work, Hua says, begins digitally, and then he prints that composition, and then paints onto the selected newspaper pages and pieces, and then covers that over painstakingly with packing tape (sometimes vertically, sometimes horizontally). The bright white of the pages is meant to change into varying yellows, over time, the colors of the stock market graphs will shift to lighter shades. Art and commerce, ars longa, vita brevis: guess which Hua is betting on? Hua has truly found a way of making art that is new. 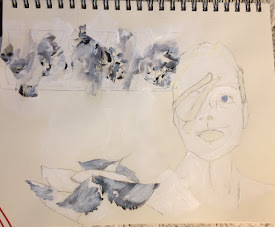 But it isn’t just this, it isn’t merely the process, which is enough, by itself, it would seem. It’s the way the results make you feel. The reason Berenson was so good at authenticating pictures was that he knew their secret lives as well as their public ones .... 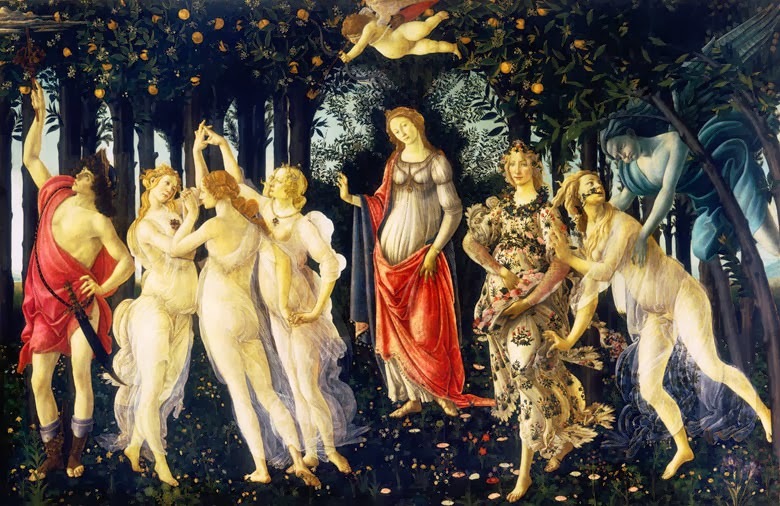 In a letter from Florence, he described spending two hours before Botticelli’s ‘Primavera’: ‘It seemed so much greater than ever, and an everlasting rebuke to people who want to submit art to [trial by headlines?] newspaperology .... You can say that it is beautiful of course, you can call people’s attention to the transparency of color, to the half tints of golden cherry and olive green, to the flowers painted in low relief ... and a thousand other things, but you can’t “give away” the secret of the picture. And I guess that is what I would like to leave you with, here: go and see these works. That “secret” of the painting will come to you, I know, when you are standing in front of Hua’s works. Take the risk.